Friday 1st February 2019. TTT “This is Now” (SOKAFIT Demonstration with Khary Roberts). TELEVISION. Friday 6th April 2018. Trinidad Guardian. 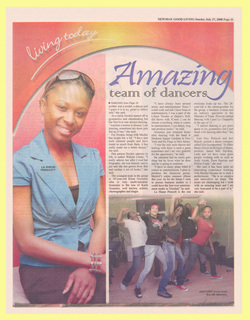 “Caribbean Crews ready for World of Dance Trinidad.” DAILY NEWSPAPER. 21 November 2017. Trinidad Express. “Caribbean School of Dancing Turns 60” Pg 29. DAILY NEWSPAPER. 25 June 2017. CNN “Parts Unknown with Anthony Bourdain” TELEVISION. 14th June 2017. CTV. Good Morning Trinidad and Tobago. TELEVISION. 19 December 2016. Loop - Your News Now. "WATCH: SOKAFIT hosts pop up soca burn in downtown POS." TRINIDAD. ONLINE. 17 June 2016. Martinique 1ère. MARTINIQUE. RADIO INTERVIEW. 30 May 2016. HowZat Magazine. Issue 13. Pg. 21. "Sport of the Month - Sokafit" TRINIDAD. ONLINE. 22 May 2016. Sunday Express - Women's Express. "Let the Rhythm Move You - La Shaun Prescott" TRINIDAD. PRINT. 9 May 2016. TV6 - Cup of Joe. TRINIDAD. TELEVISION INTERVIEW. 6 May 2016. Fanm Djanm. "The Strength of a Trinidadian Artistic Director" NEW YORK. ONLINE INTERVIEW. 25 March 2016. TV6 News. "Sokafit Hits Tobago" TRINIDAD. ONLINE & TELEVISION. 7 August 2015. ET&T Magazine. "ET&T Hot Seat: La Shaun Prescott" TRINIDAD. DIGITAL MAGAZINE. 28 April 2015. Morning Prime. Channel TV. TRINIDAD. TELEVISION INTERVIEW. 11 August 2014. Kenwyn Arts Blog. "Photographing La Shaun Prescott." By Kenwyn Murray. TRINIDAD. ONLINE INTERVIEW. 26 June 2014. Feature on WABC-TV Channel 7 Eyewitness News. "Jump, Wave and Wine your Way to Fitness with Soca" by Kizzy Cox. NEW YORK. ONLINE INTERVIEW. 18 June 2014. Feature on Pix11 News teaching Soca Class at the Mark Morris Dance Center. NEW YORK. TELEVISION INTERVIEW. 26 February 2014. Hybrid Caribbean Fitness Magazine. Issue #2. Feb-Apr. Cover Page & pgs 24-31. Trinidad. ONLINE AND PRINT MAGAZINE. 12 July 2013. 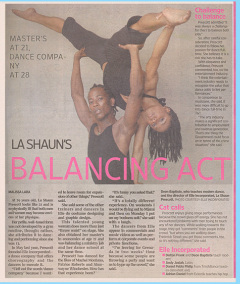 Newsday "Elle NYTT dance company launches En Route" Trinidad. DAILY NEWSPAPER. 11 July 2013. First Up with Paul Richards on CTV. Trinidad. TELEVISION INTERVIEW. 10 July 2013. Feature on CNC3TV News. Trinidad. TELEVISION INTERVIEW. 30 June 2013. Trinidad Guardian. "Elle Troupe Focuses on Modern Dance." Trinidad. DAILY NEWSPAPERS PRINT AND ONLINE. 22 June 2012. Metro Magazine. Issue #41. 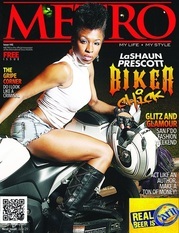 "La Shaun Prescott Biker Chick" Trinidad. ONLINE & PRINT MAGAZINE. 18 July 2011. ET&T Weekly Magazine. June 2011 Issue. "Elle 7's La Shaun talks about opening branch in New York" Trinidad. PRINT MAGAZINE. 5 June 2011. 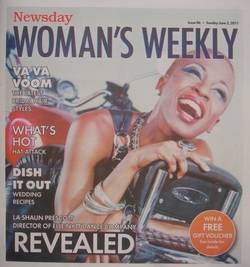 Newsday Woman's Weekly. "La Shaun Prescott Director of Elle NYTT Dance Company Revealed." Trinidad. WEEKLY NEWSPAPER. 17 April 2011. Jay Blessed Media. "Interview: Meet La Shaun Prescott – The Future of Dance!" New York. ONLINE MAGAZINE. 31 January 2011. Ezone Issue 5. Pg 17. "You Do What? Dance for the Stars." Trinidad. PRINT MAGAZINE. 12 April 2010. Outlish Magazine. "LaShaun Prescott – From Machel to Mogul" Trinidad. ONLINE MAGAZINE. 17 May 2009. Sunday Punch. Pg 7. "A New Generation of Dancers" Trinidad. WEEKLY NEWSPAPERS. 22 February 2009. Catholic News. "Meet Elle - The Young Dance Crew." Trinidad. 25 January 2009. Sunday Guardian. Front Page. Trinidad. DAILY NEWSPAPER. 30 November 2008. Sunday Express. "20 Questions with La Shaun Prescott" Trinidad. DAILY NEWSPAPER. 9 November 2008. Trinidad Express. Pgs 16 & 17. "Dancing Their Way Around The World" Trinidad. DAILY NEWSPAPER. 27 July 2008. Newsday. Pg 11. "Amazing Team of Dancers" Trinidad. DAILY NEWSPAPER. Patrice Roberts "Big Girl Now"
Jillionaire & Salvatore Ganacci feat Sanjin "Fresh"
Machel Montano "Going For Gold"
Machel Montano "Pump Yuh Flag"
Machel Montano, Pitbull and Lil John "The Anthem Remix - Defense"
Patrice Roberts & Machel Montano "Tempa Wine"
Machel Montano "Rollin" and "Blazin The Trail"
Umi Marcano "Move That Body"